Marie Mountain Clark was born at West Liberty in 1915. Reared on a farm in West Des Moines, Iowa, she and her younger sister were assigned to turn on the aircraft marker lights on the Des Moines Radio Range tower. While studying music at Drake University in 1939, she joined the CPTP, learned to fly at the Des Moines Flying Service, and taught navigation and meteorology in the military training courses at Dowling College. Prior to joining the WASPs in August 1943, she had logged 76 hours. When her instructor was demonstrating spins in a Fairchild PT-19, Marie’s seat belt became unfastened and she was thrown from the cockpit. She was inducted into the Caterpillar Club, a select group of pilots whose lives have been saved by parachutes. After receiving her wings on February 11, 1944, she served at the Las Vegas Army Air Base teaching instrument flying to commissioned pilots and flying gunnery-training missions in AT-6s. Part of her assignment was engineering test flying in the Bell P-39, the Bell P-3 and the Beechcraft At-11. She also flew B-26’s and B-17s. When the WASPs were de-activated in December 1944, 736 hours of her total time had been logged as a WASP. 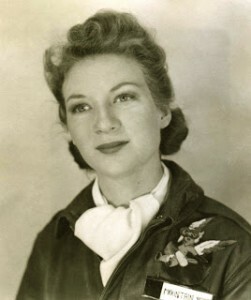 After the war she was hired by Howard Gregory, the owner of the Des Moines Flying Service, to fly surplus airplanes to civilian airports, where they were to be auctioned. For her WASP service Marie was awarded the WWII Victory Medal and the American Theater Medal. She considered herself fortunate and felt both honored and privileged to have trained in and flown military aircraft during WWII. Marie married John Alden Clark, a bomber pilot who had completed 32 missions in B-17s over Germany.